Here is this year’s photo gallery for your viewing pleasure. Thank you to everyone who sent photos. Hyvää Joulua, Merry Christmas! 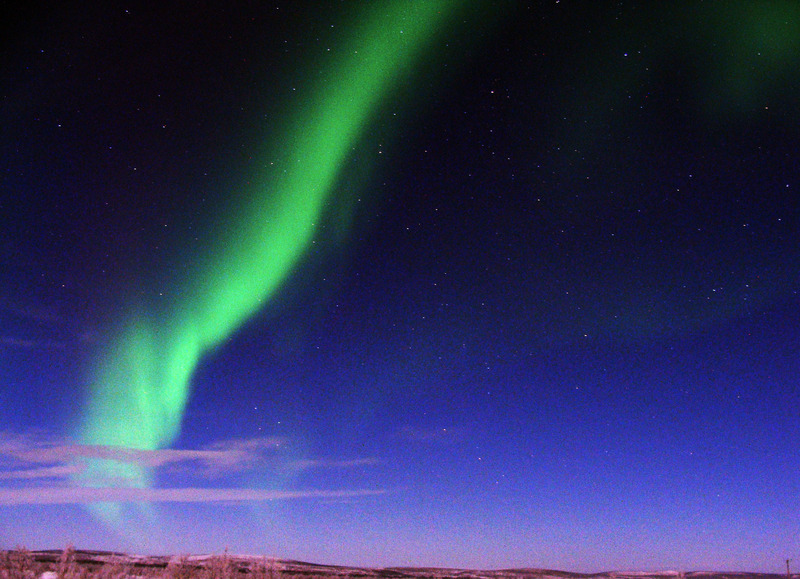 A photo of The Northern Lights taken by Tero Kotavuopio. 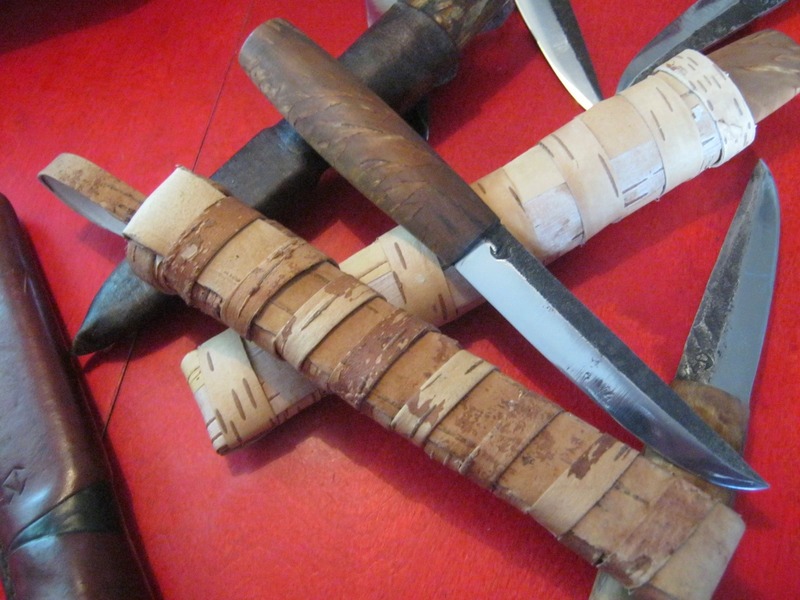 Norway has a rich and proud knife tradition with area specific styles. 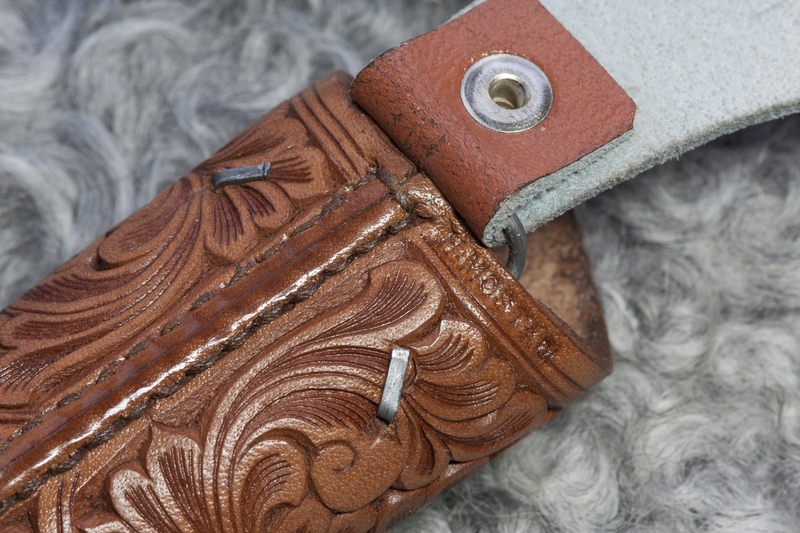 Some of the best known styles are from Agder, Telemark and Toten. 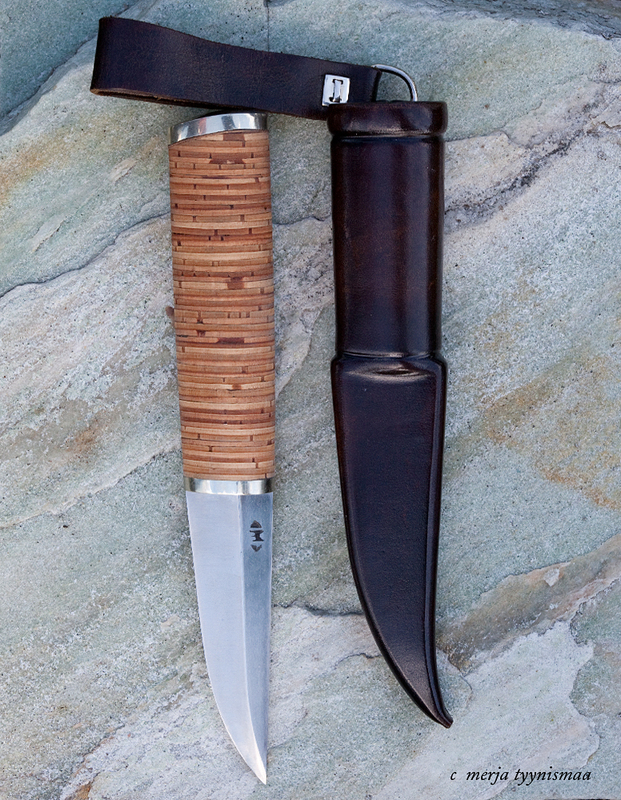 “Agderkniv” is a knife made in either of the two Agder counties in the south of Norway. 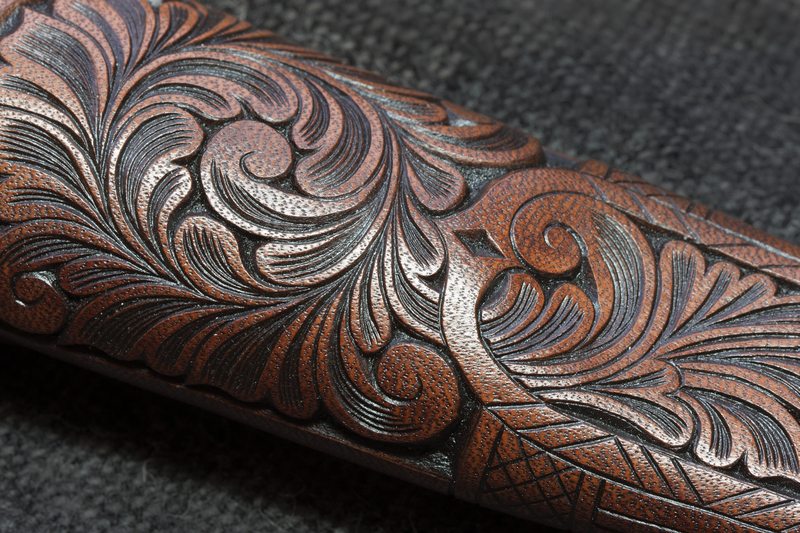 It is recognized by a rich acanthus carving on the sheath. 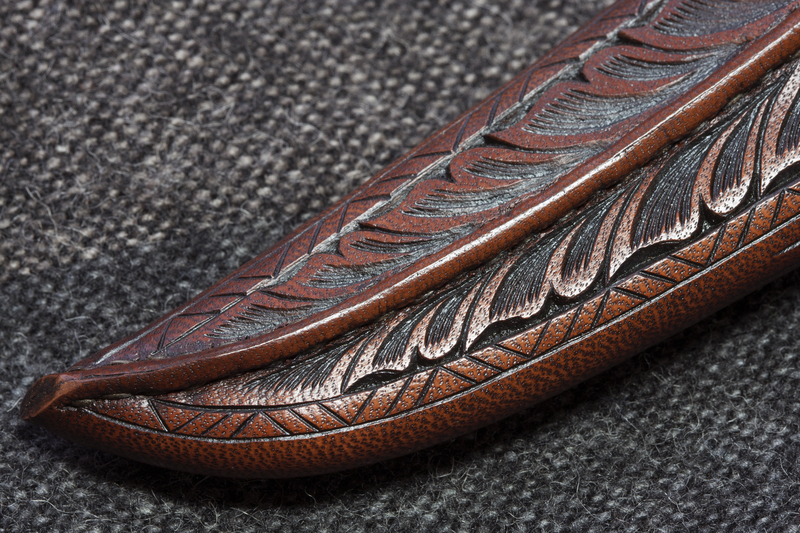 The carving pattern on the sheath of these knives is typical for the area. 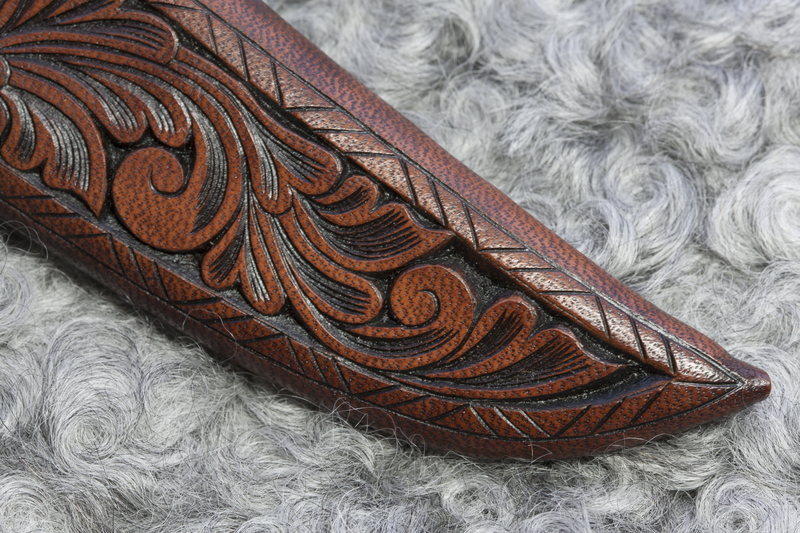 One of the most known carving styles comes from Gjerstad in East Agder. 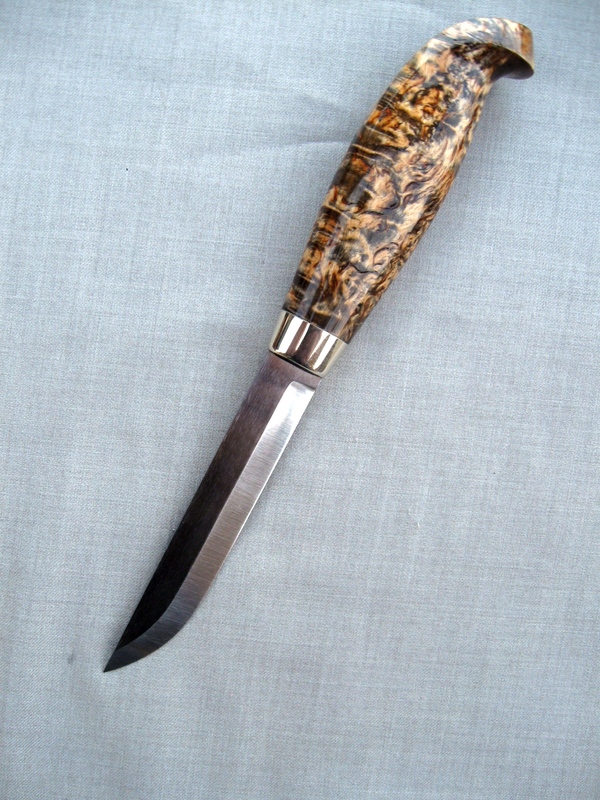 Almost all knife makers from that area carve basically the same pattern, and have done it that way for a long time. 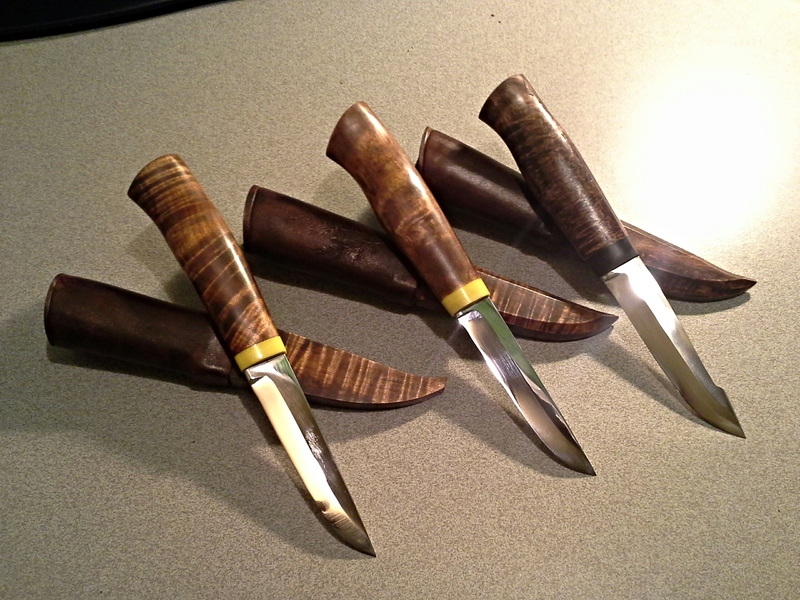 The work on the pictured Agder knives all have Gjerstad carvings. 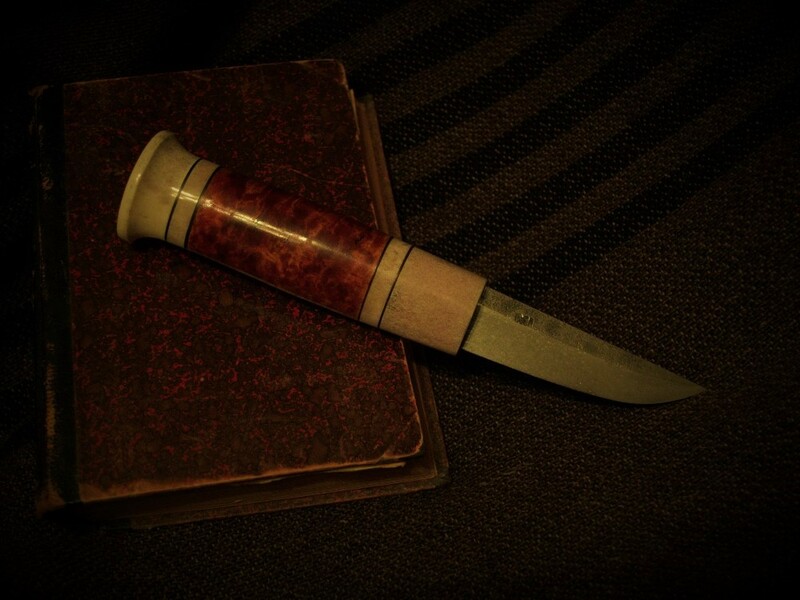 Although Gjerstad is a specific place, Gjerstad carving is more like a conceptual thing, or method. 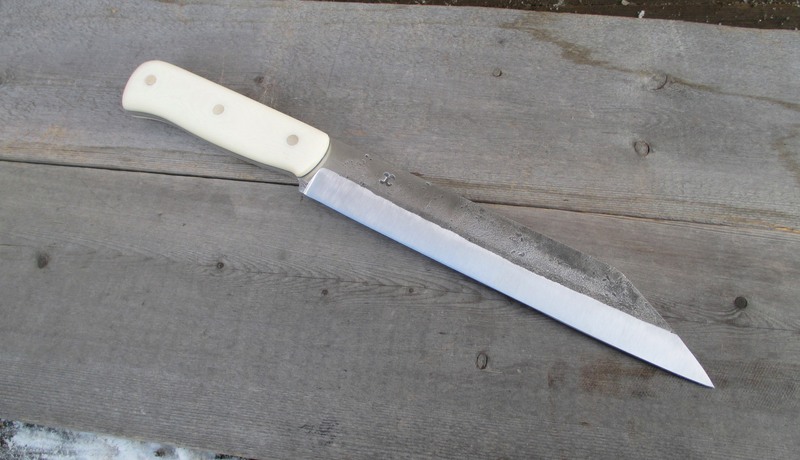 The Agder knife is a working tool. 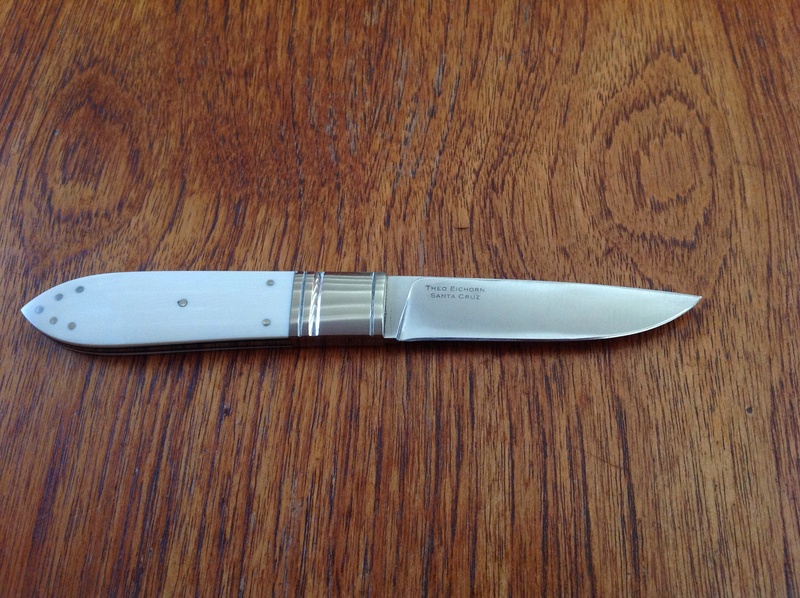 After many years of service there might be a need to replace the blade. 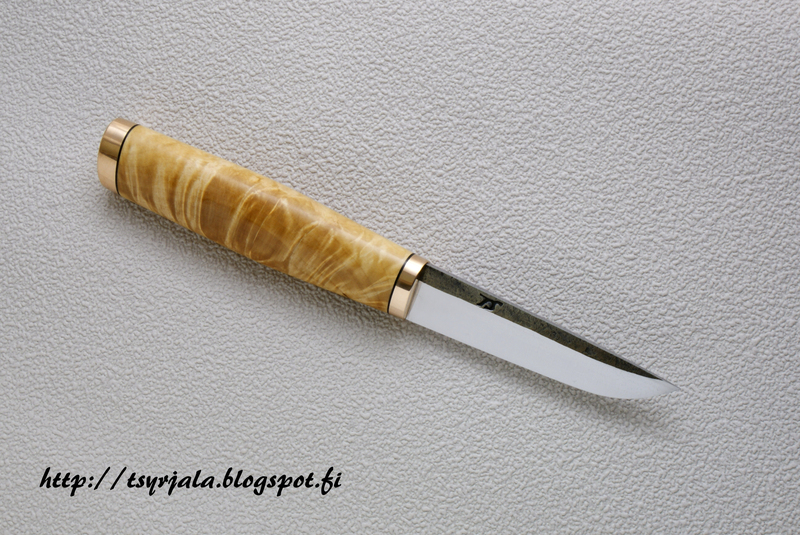 On the really well made Agder knives, the blade is so tightly fit in the handle, there is no need for glue or other adhesive. It won’t come loose unless intentionally pulled out. 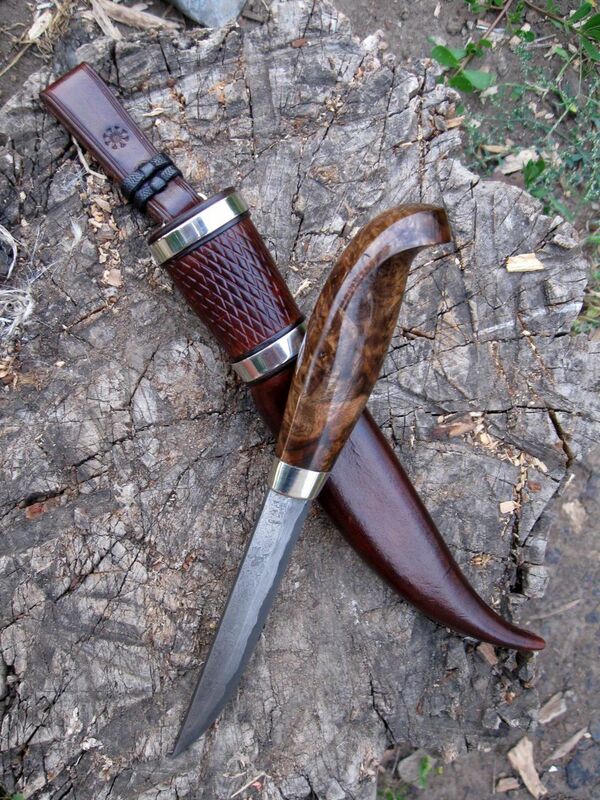 Just give it a kick on the back of the handle, and the blade comes loose. 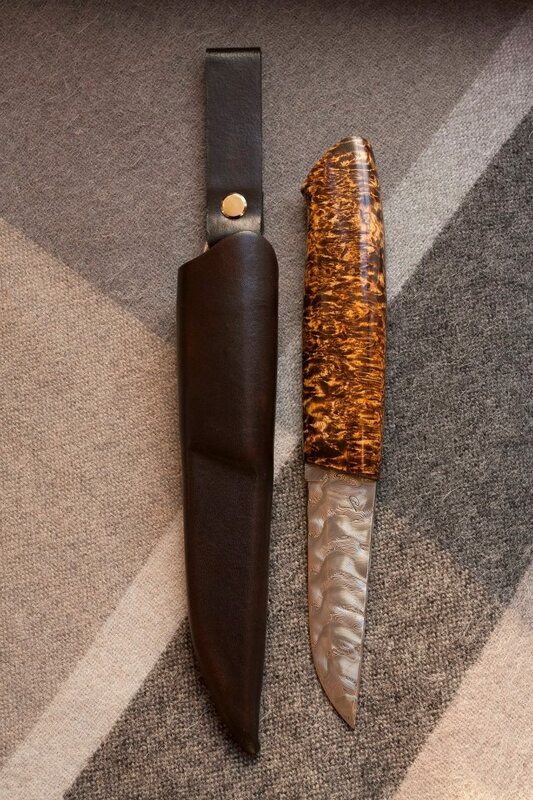 The knives from Agder and the neighbor county Telemark, typically have straight handles, straight blades and straight sheaths, although many make them curved as well. 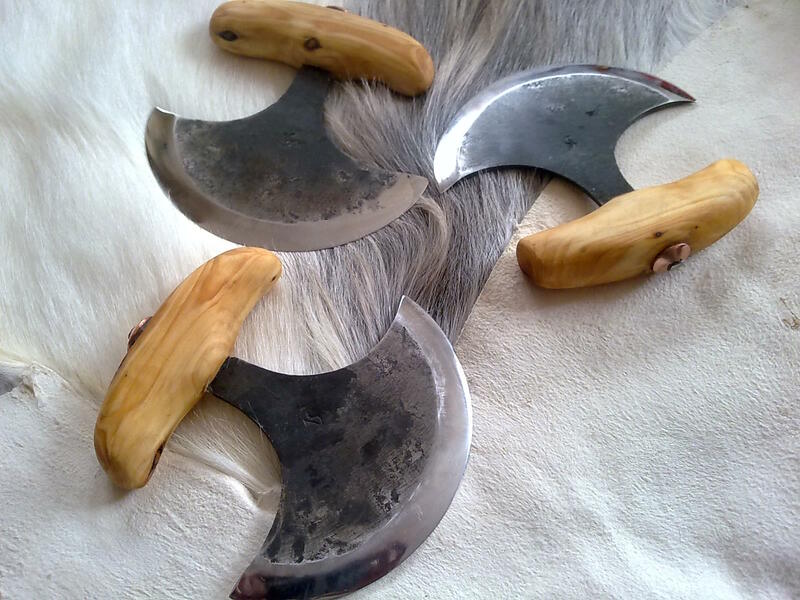 They are divided into two categories; “Brukskniv” (knife for daily use) and “Staskniv” (with silver, for special occasions). 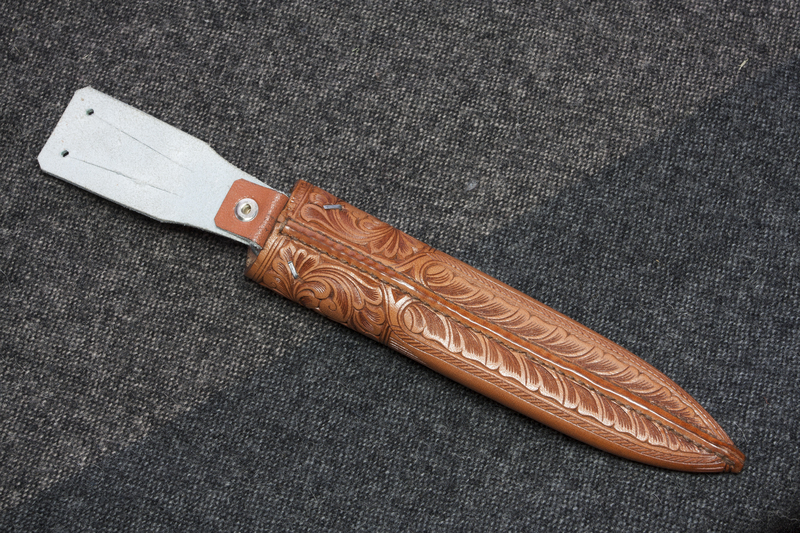 The traditional “Brukskniv” from both Agder and Telemark is often referred to as “Fredriksenkniv” in the Norwegian knife community. 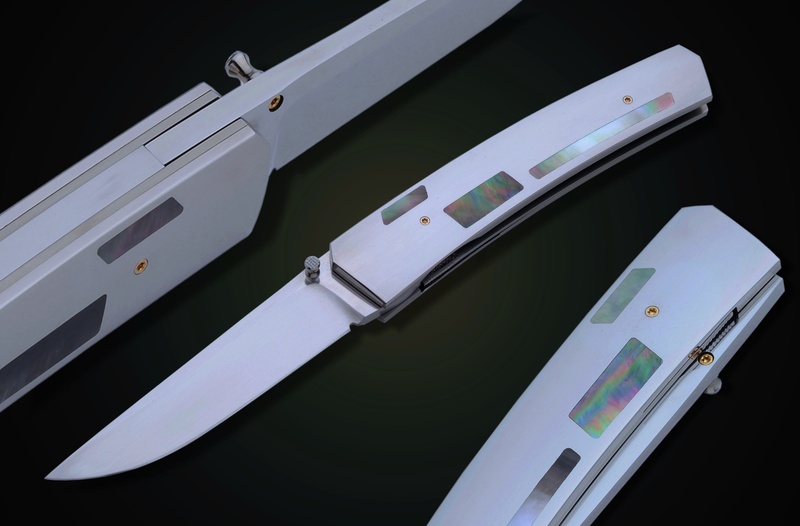 It is a conceptual term, referring to the knife maker Lars Fredriksen and the knife model he developed. 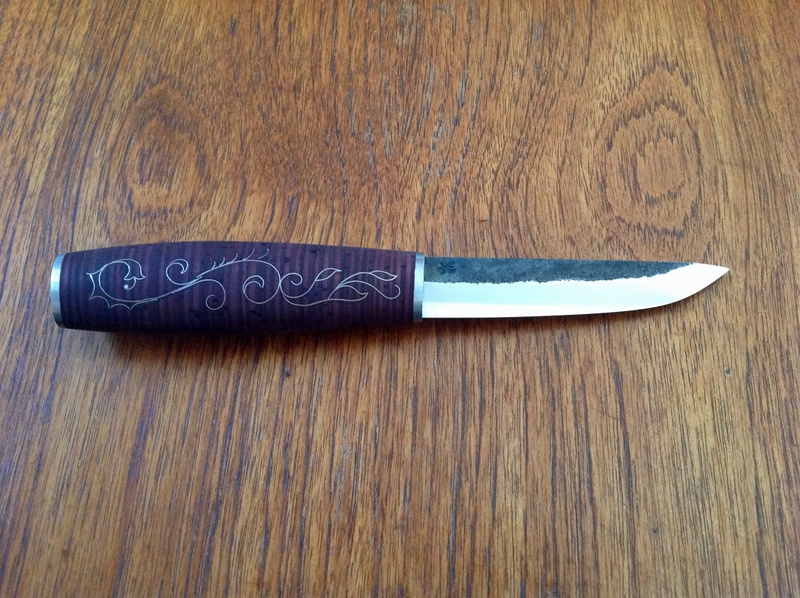 A Fredriksenkniv is a working knife for everyday use, from Agder or Telemark with acanthus carvings. 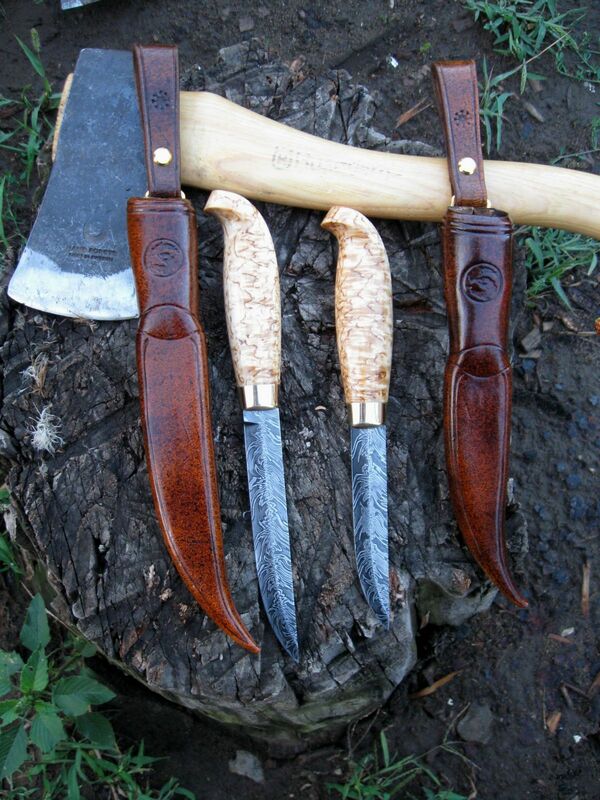 Both Agder- and Telemark knives are made to be multi-purpose tools to be used on the farm or in the woods. Historically, every farmer in Norway is his own boss without any employees, and so must be able to handle everything themselves. 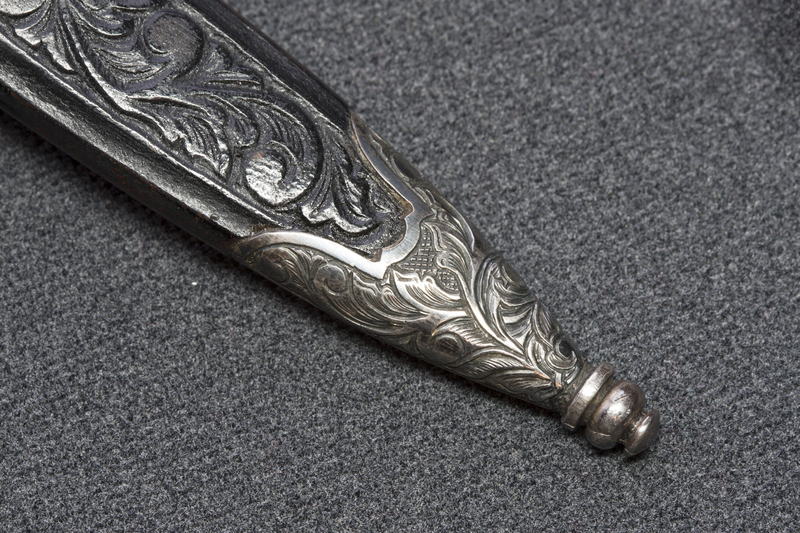 The knife of the farmer was the everyday carry tool to fix almost anything, and even the beautiful silver bolstered Staskniv was designed to be useful if the horse sledge was broken or fix a horse shoe on the way back from church on a Sunday. 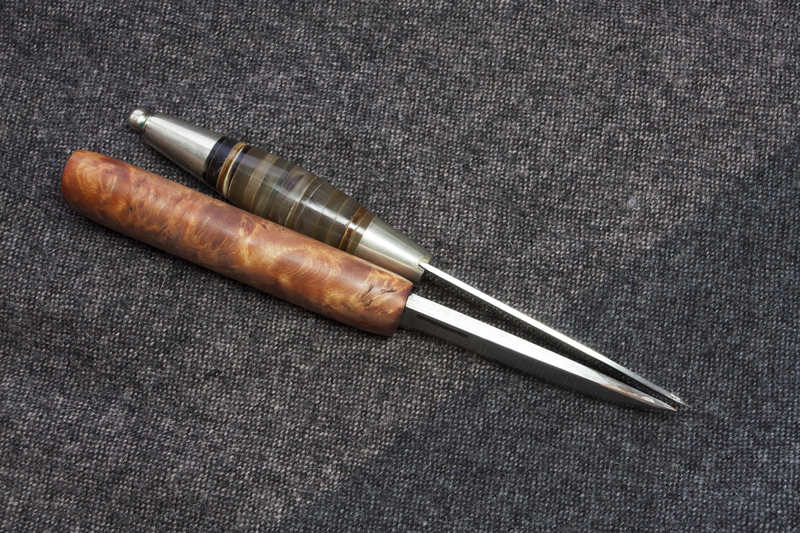 The blade is therefore quite thick (4-6mm) so it would even work as a prying bar if needed. 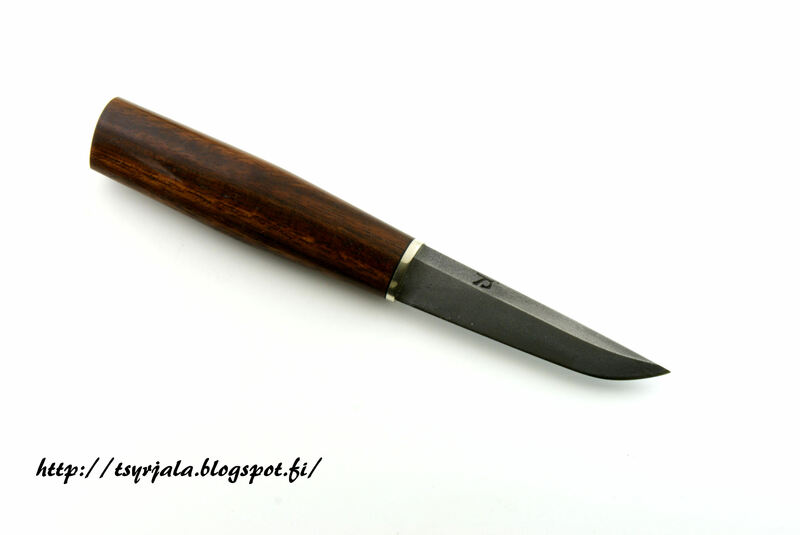 In a time when almost everything was made of wood, the knife could be used to modify and fix almost anything. 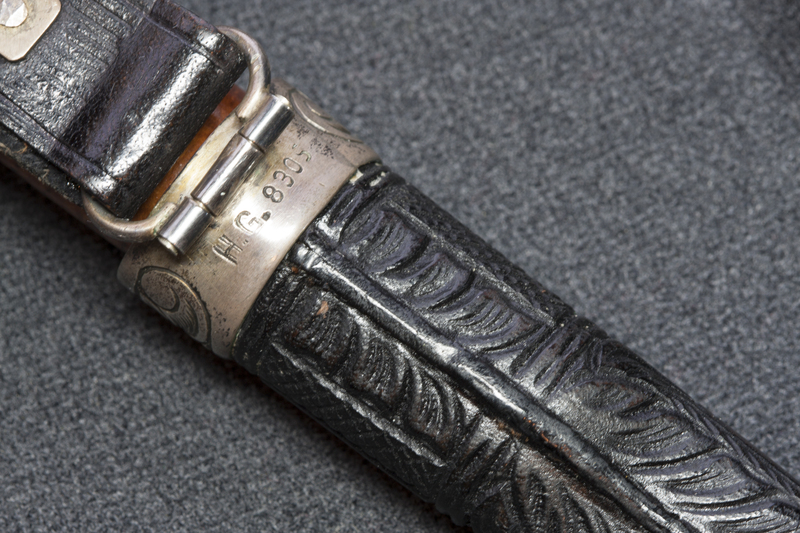 It was a good companion to be worn at all times, even on the way to church on Sunday or a wedding together with your finest clothes. 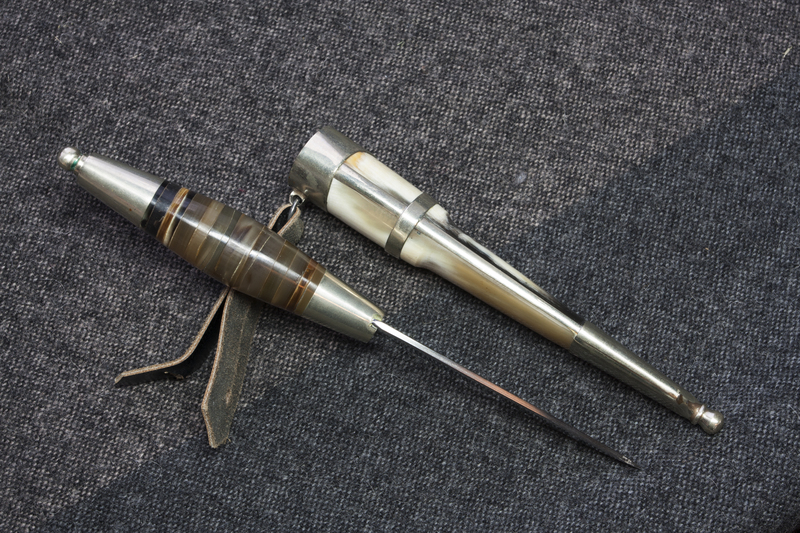 For everyday use, there was the Brukskniv, and in the church on Sunday there was the silver bolstered Staskniv. 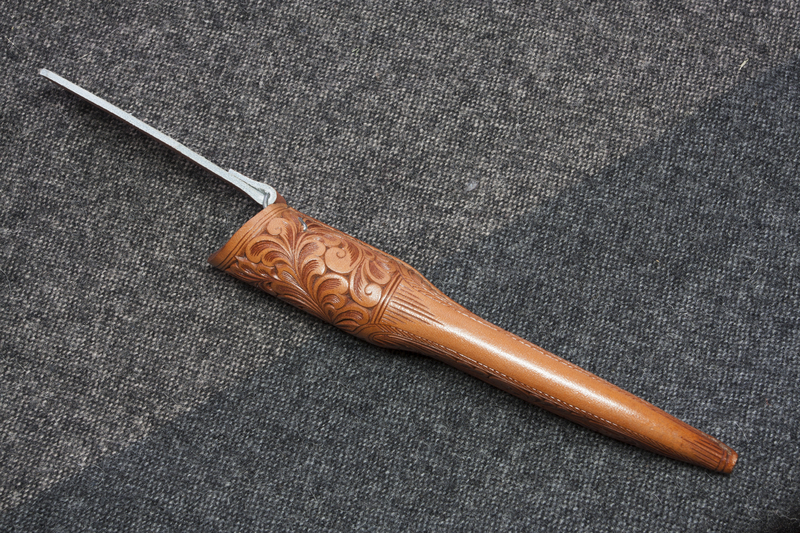 The handle on the brukskniv and the staskniv is typically 104mm long, straight and with a fairly round convex shape. 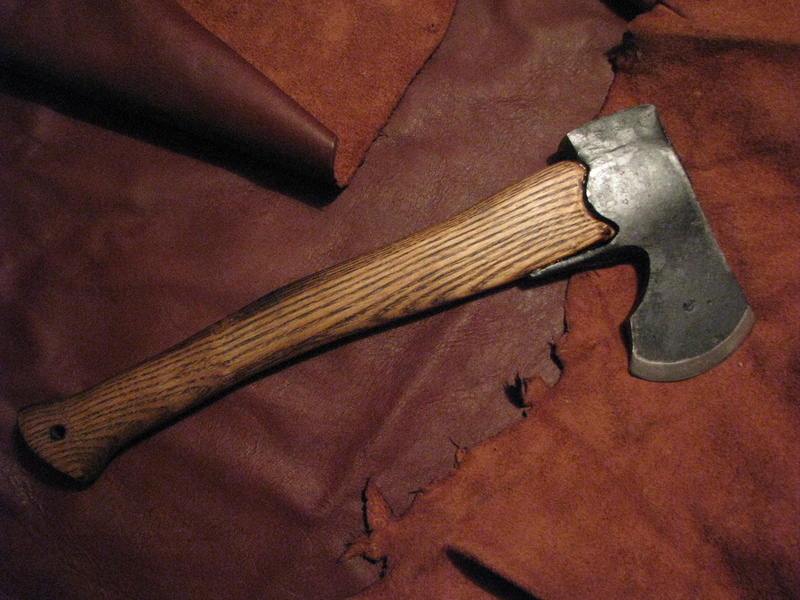 The brukskniv has a little thicker handle than the staskniv, for heavier work. 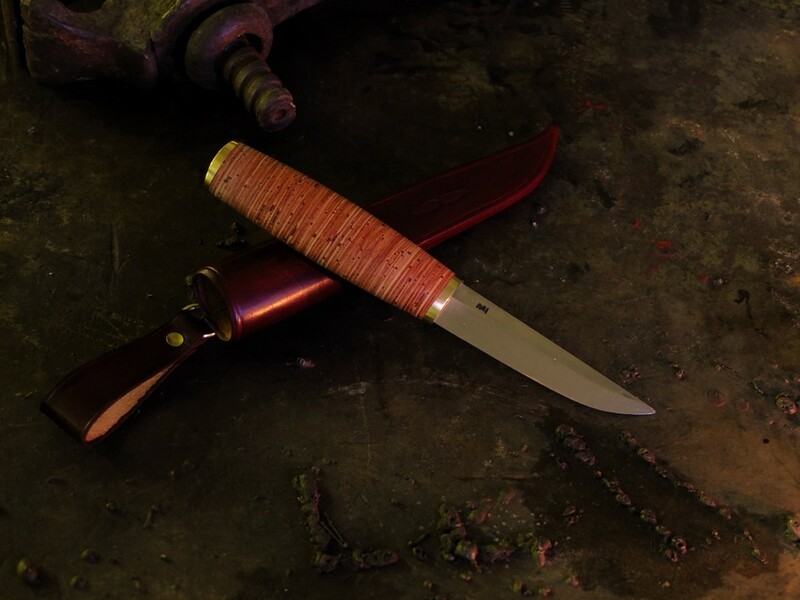 Although the shape might seem a little boring compared to fancy curved contemporary knife handles, they are surprisingly effective and comfortable when working with wood for long periods. 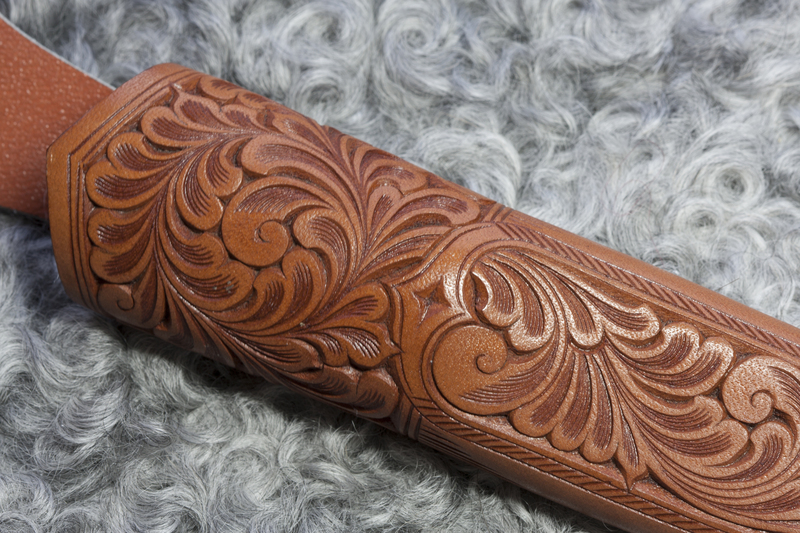 It allows many different grips and working angles. 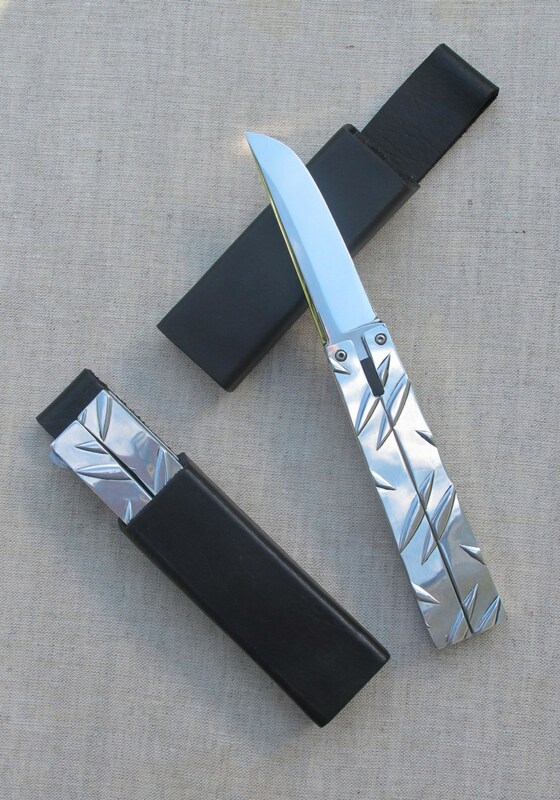 You can easily use a knife like that for hours without getting tired. 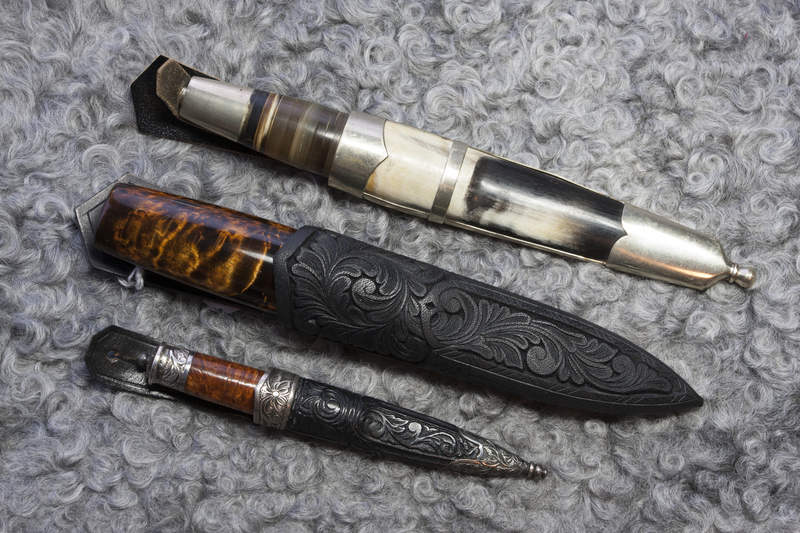 Not all knife makers in that period made both knives and sheaths. 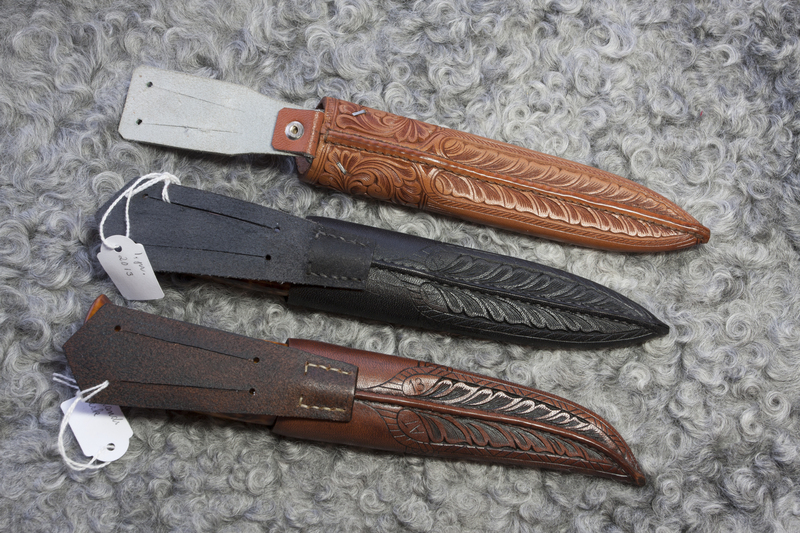 Some specialized in making sheaths and some in making knives. 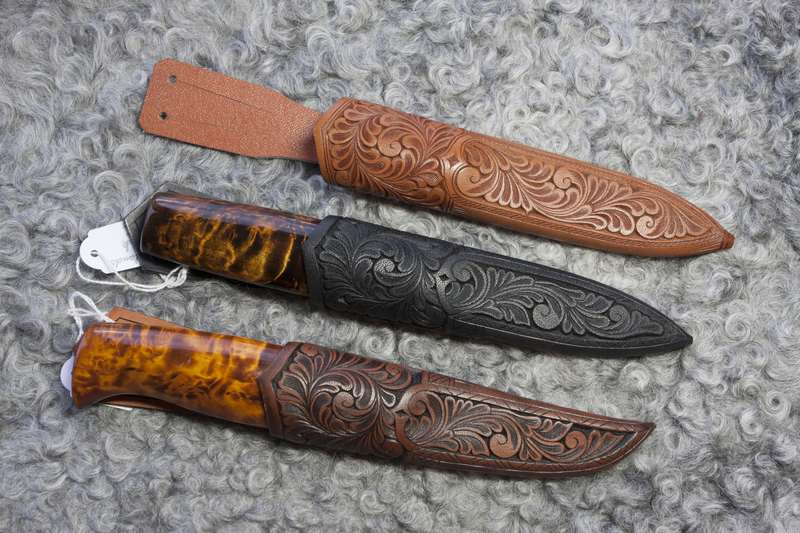 The knives from the area were made to meet approximately the same size specifications, so that a knife handle from one maker would fit the sheath from another maker. 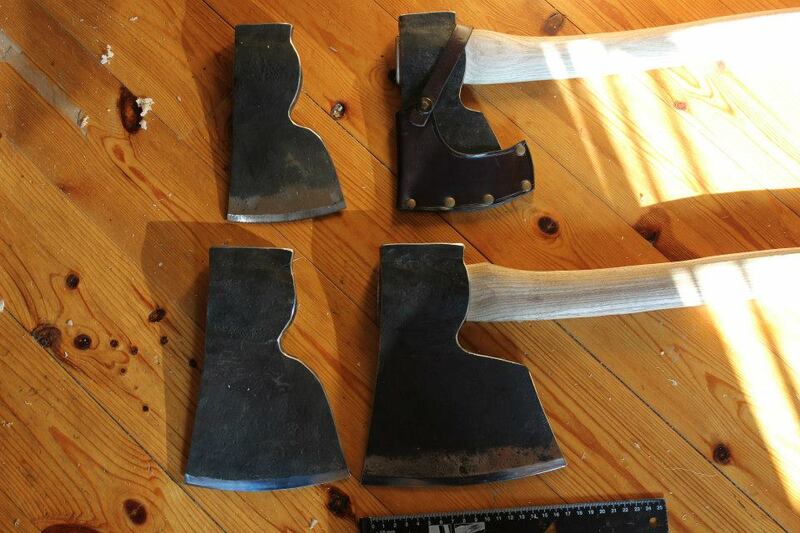 This resulted in area specific styles, such as the Agder sheaths in the pictures. 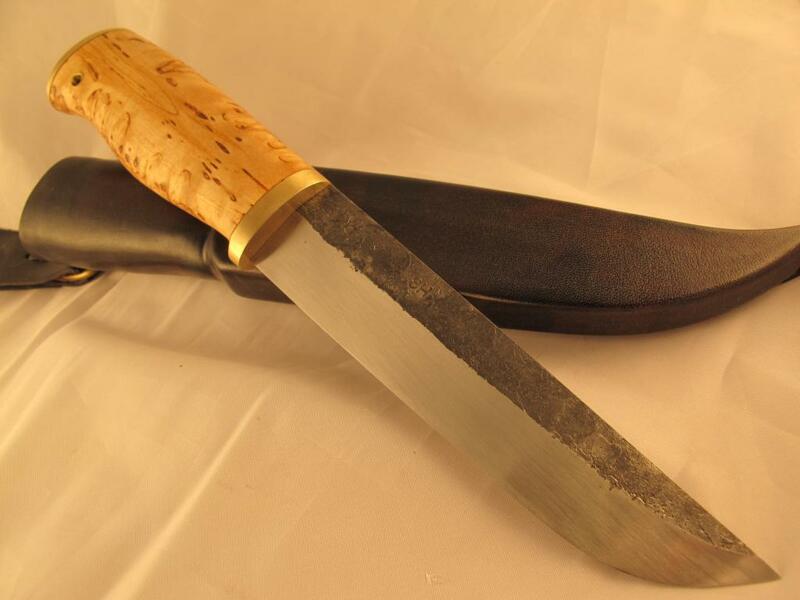 The knife blade is always handmade laminated steel, with a center of hard steel wrapped in softer steel. It is never factory made stainless steel. 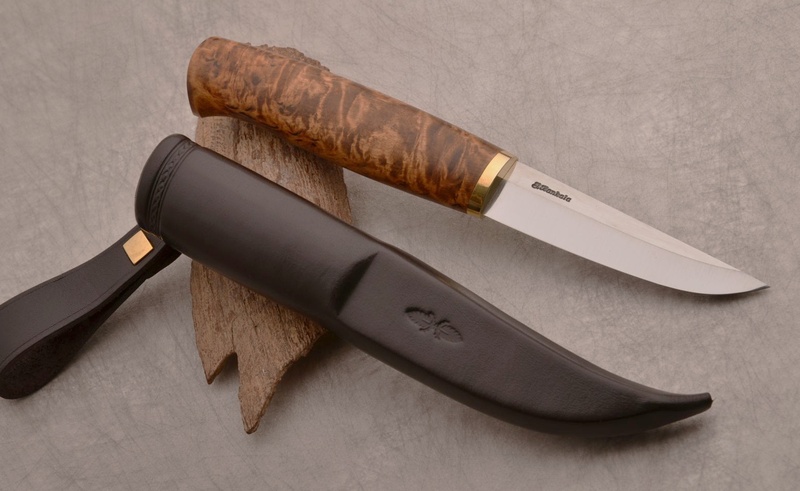 The owner of the knife depended on the quality of the blade, and the laminated blade, made by the local blacksmith, was considered to be the best. 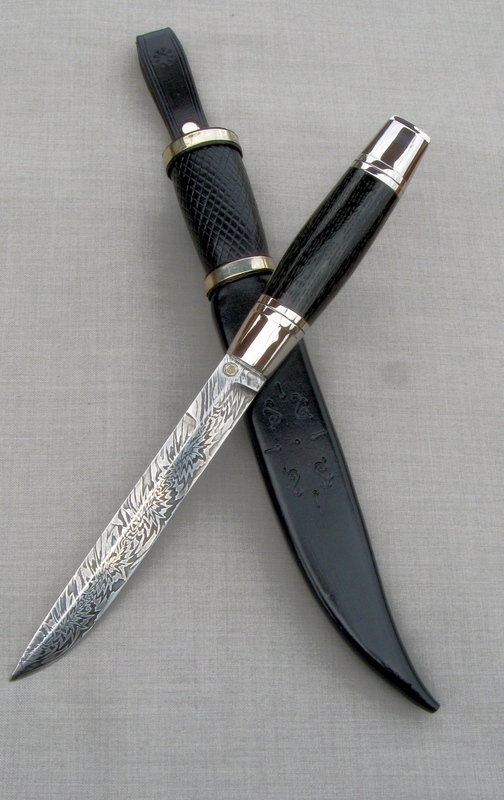 A factory made stainless steel blade was considered to be of lesser quality. 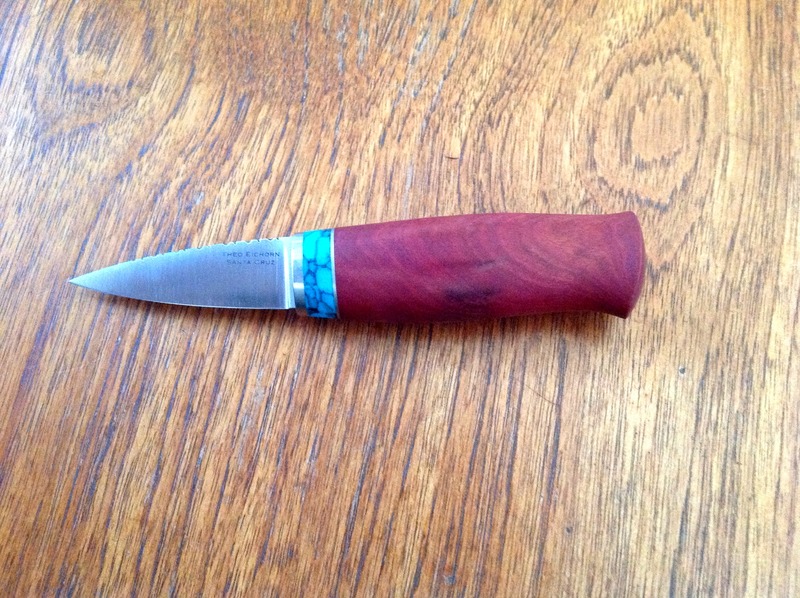 A handmade laminated blade has a matte grey finish. 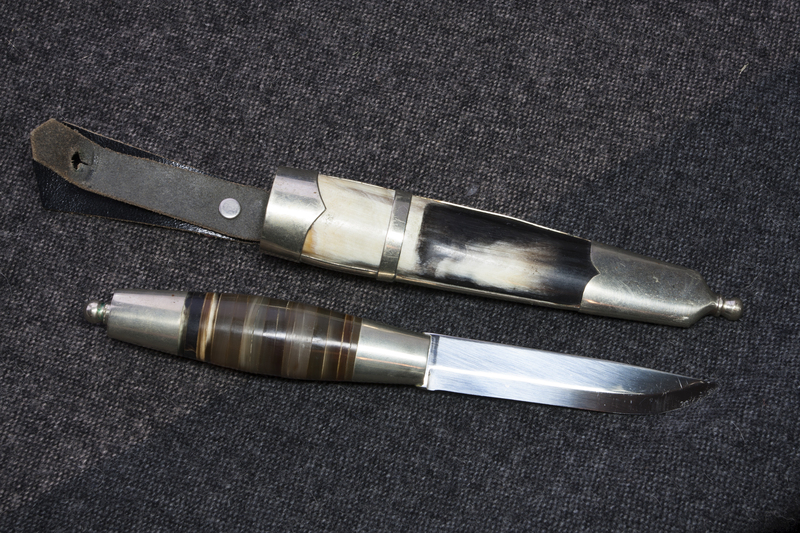 All Agder and Telemark knives therefore have matte blades. 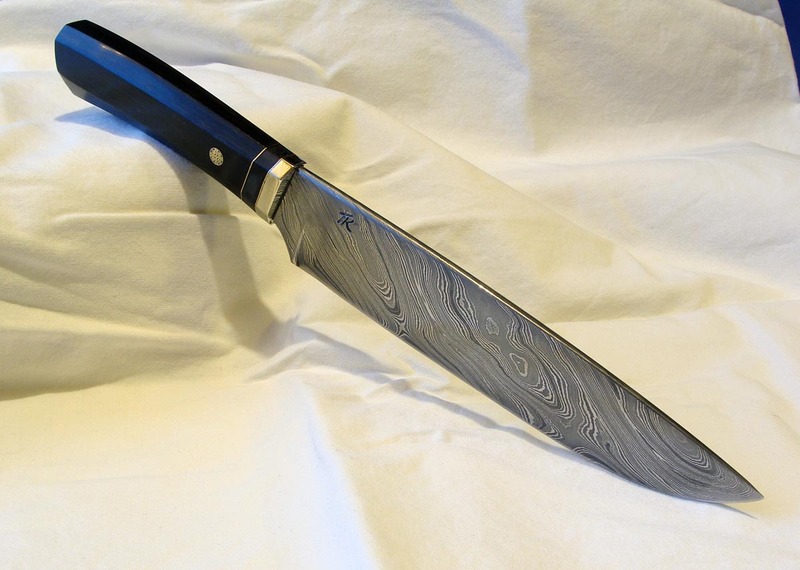 A stainless steel blade has a more shiny appearance. 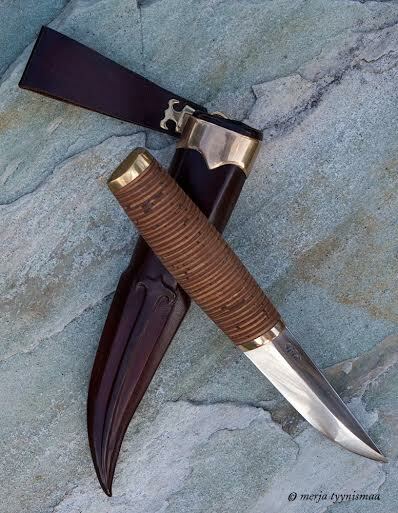 An Agder- or Telemark blade with a shiny polished look is almost unacceptable. 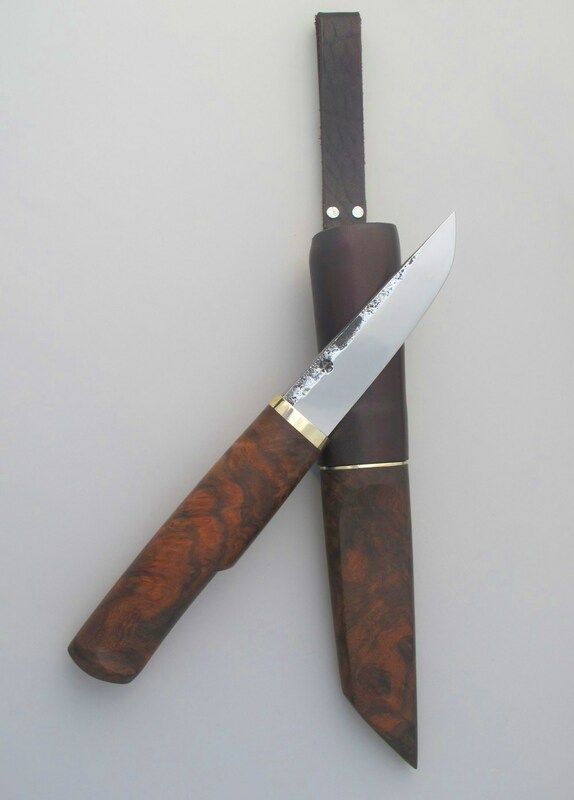 Even if today’s stainless blades are of the very best quality, maybe even better than the laminated ones, you will probably not find a blade like that in a contemporary traditional knife. 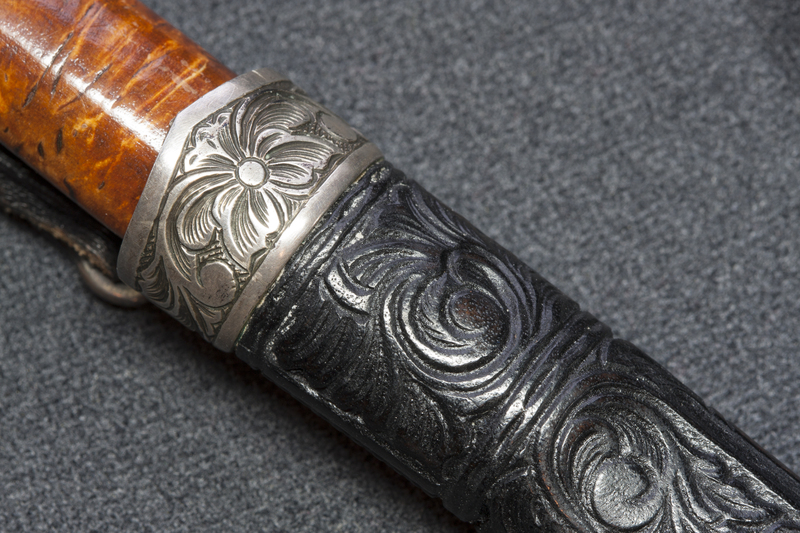 It just wouldn’t look right with the shiny blade. 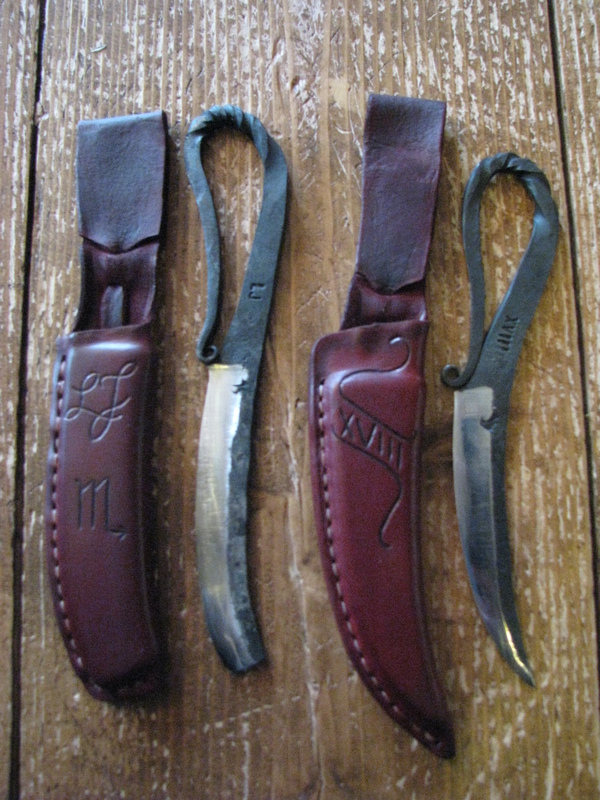 Blade comparison, Adgerkniv and Totenkniv. 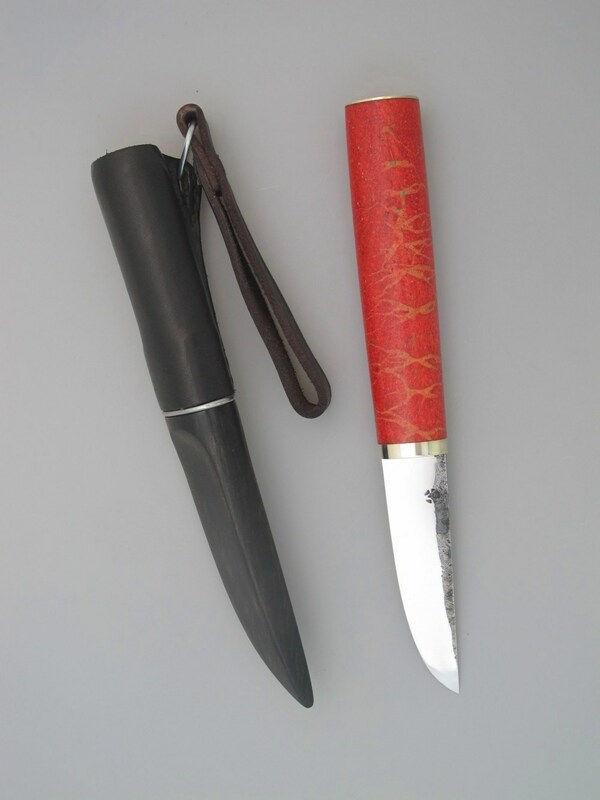 There is one traditional knife in Norway where this is not the case, and that is the knife from Toten. Toten is an area on the west side of the lake Mjøsa, Norway’s biggest lake. Some small towns in the area are Gjøvik, Lena, Eina and Skreia. This area has a rich black soil and lime rock. The soil is one of the best in Norway, and it makes agriculture easy, especially for potatoes. The farmers have more money too, and the farms are bigger. Some of the farmers on the larger farms in Toten had enough money to hire others to do the work. They could even get someone to fix the sledge and shoe the horse for them, too. 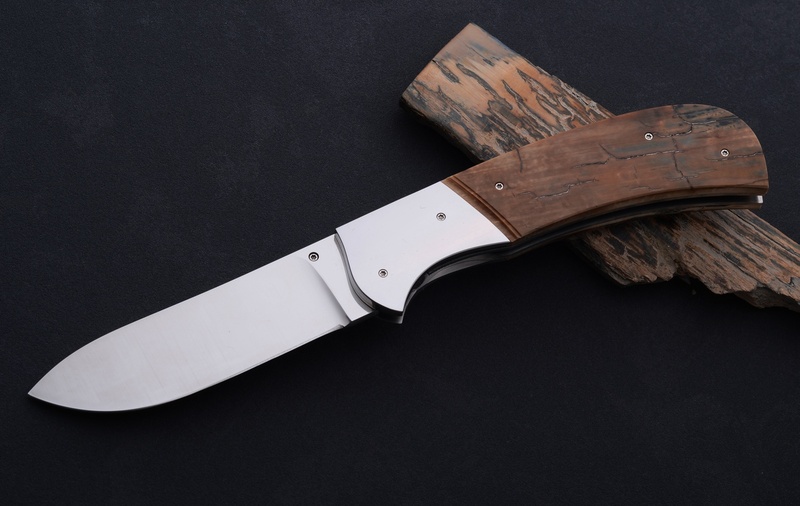 They were less dependent on the quality of the blade, and you will therefore find Toten knives with shiny, unlaminated, factory made stainless steel blades. 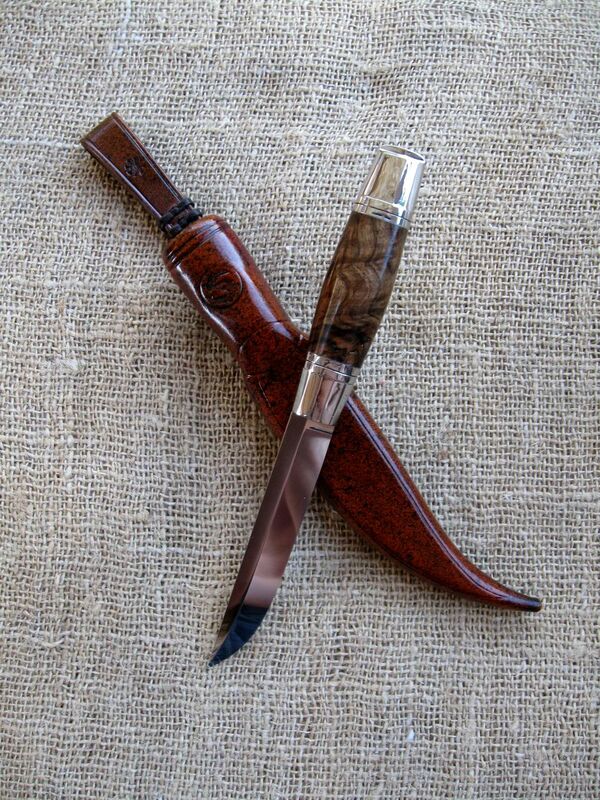 A shiny blade is accepted on those traditional knives. 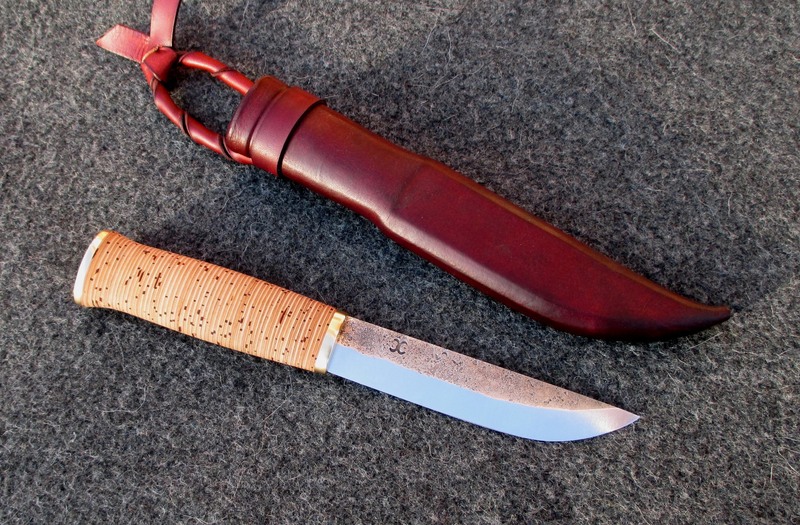 The traditional Toten knife is fairly similar to the Telemark staskniv in shape, but has a different build. It too is straight. 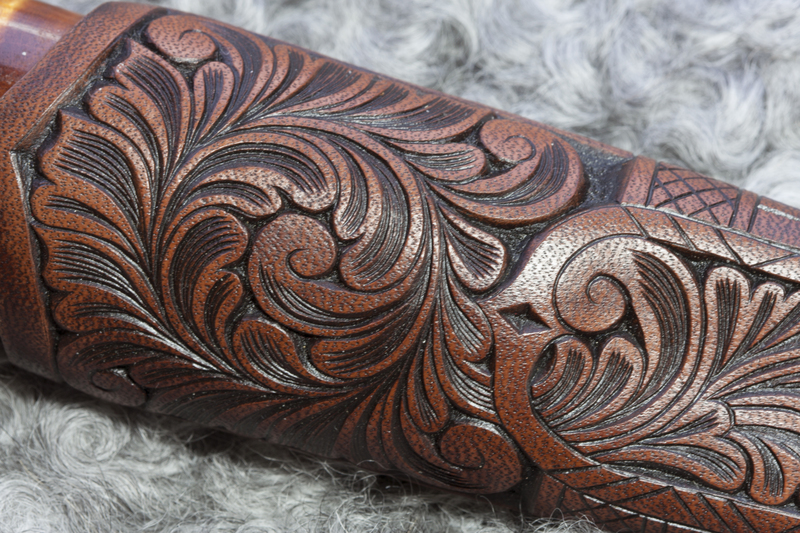 It does not have carvings, however. 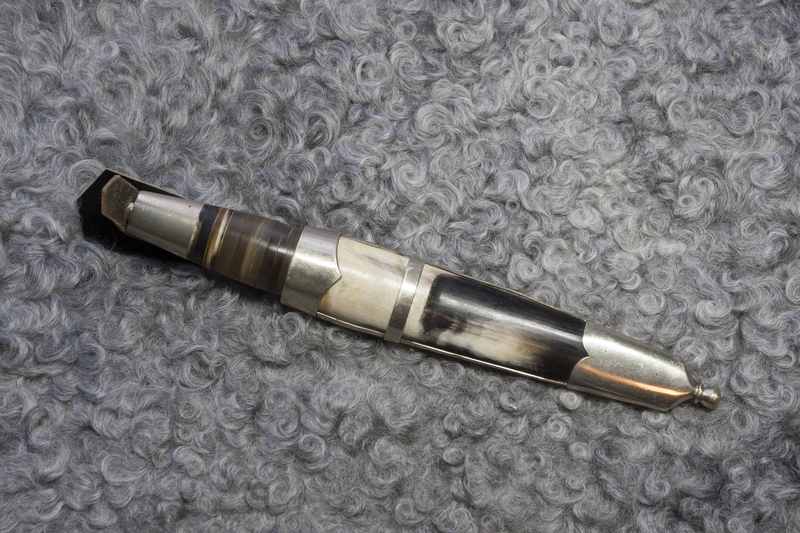 The sheath is made from cow horn in a metal frame and the handle is either laminated cow horn or laminated birch bark. 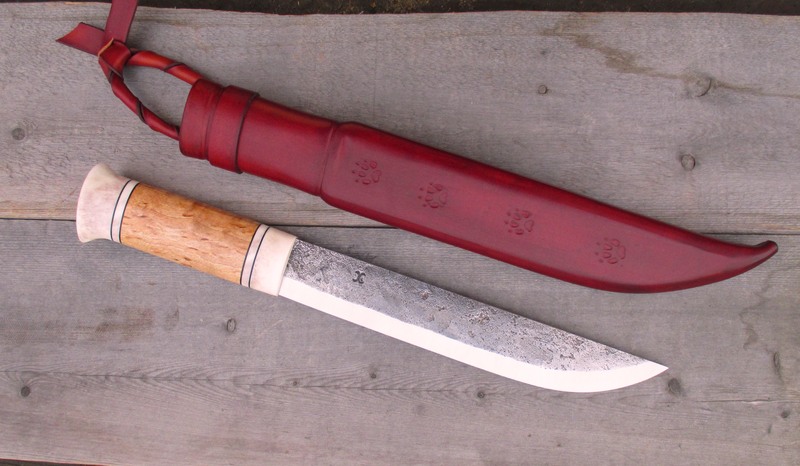 The Toten knife has remained the same for several centuries. 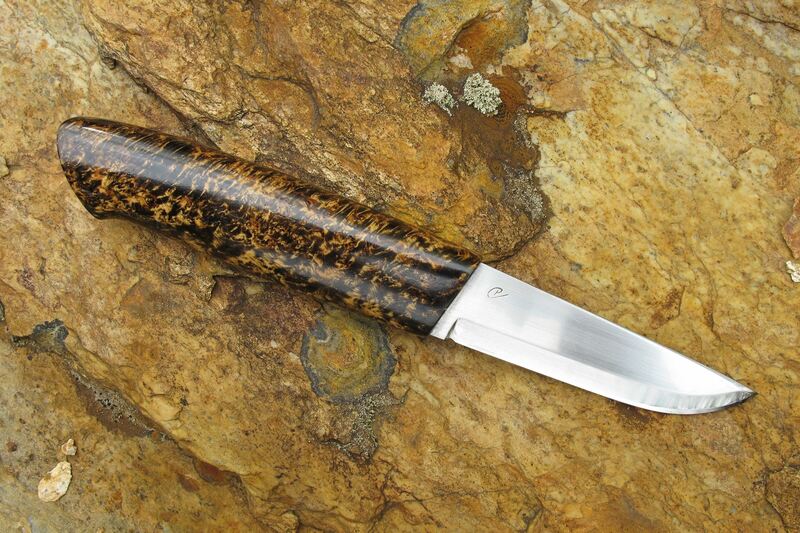 It is difficult to see the difference between a contemporary knife made the traditional way and a 200 year old knife. 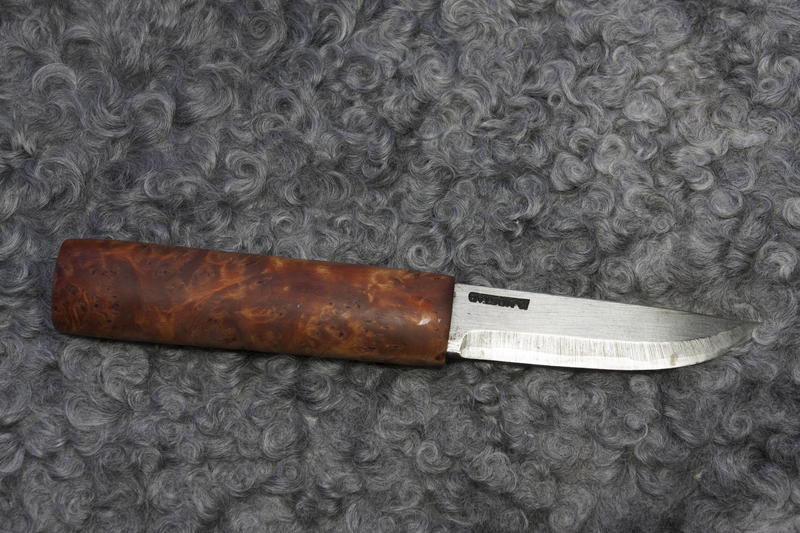 In the beginning of the 1980s, Aasmund Voldbakken changed the way sheaths were made and the entire knife making process in Norway, and even Sweden and Finland, was influenced by his way of doing things. 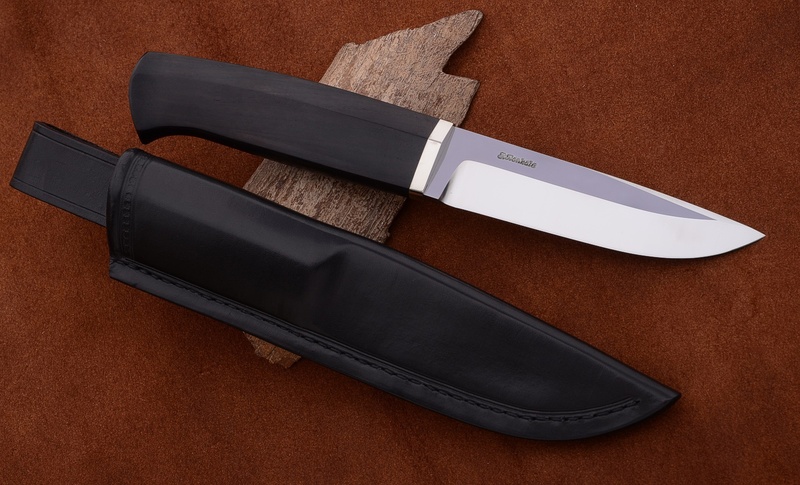 He introduced a method of shrinking wet leather to the finished knife handle for perfect fit, the way most Scandinavian knife makers make sheaths today. 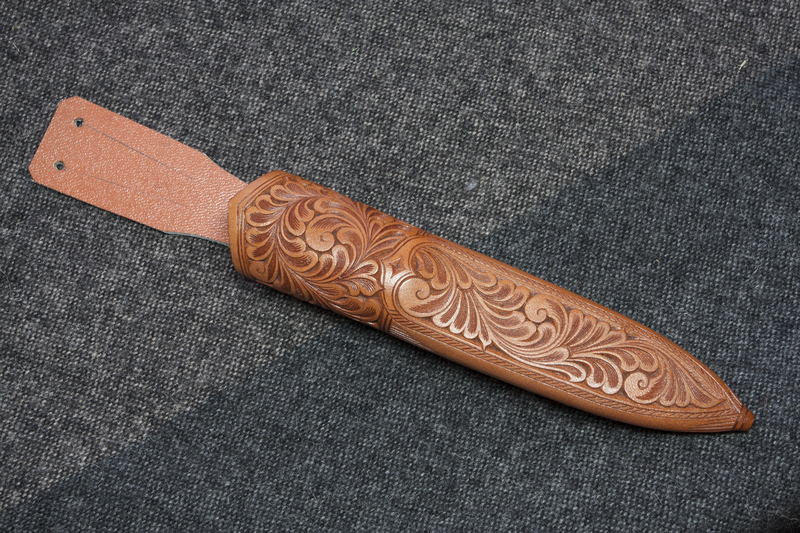 From that moment, the sheath was made to be knife specific, and could not be swapped between different knife makers. 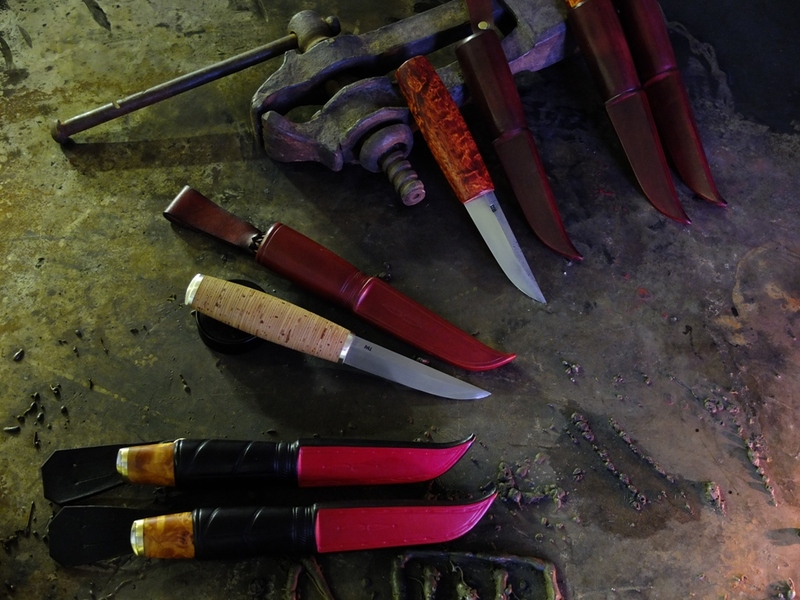 In a way, he brought more individuality into the knife making process. 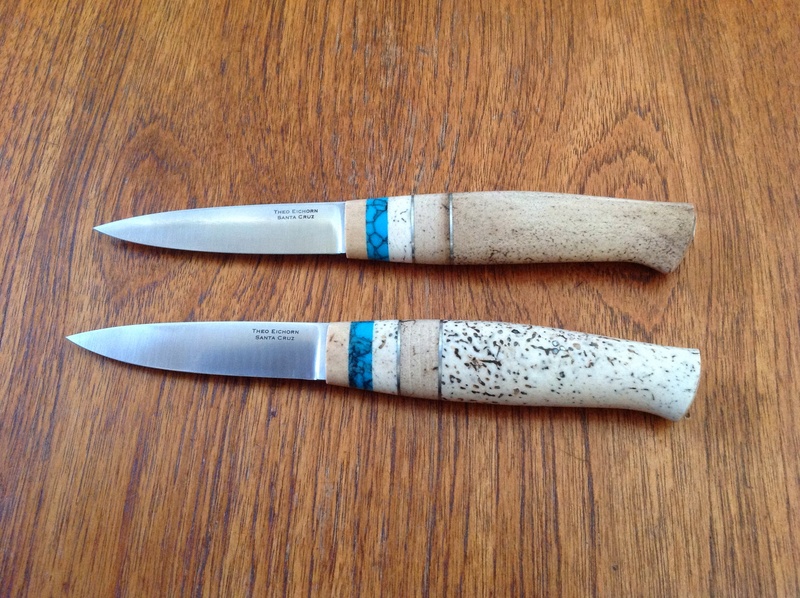 Aasmunds work is essential to the contemporary knife making process in Scandinavia. 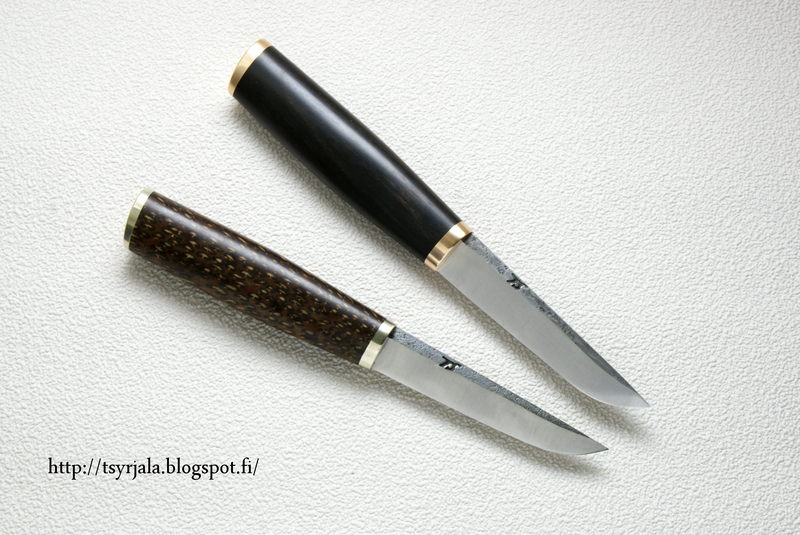 Thank you to Sverre Solgård for this article about Norwegian knives! 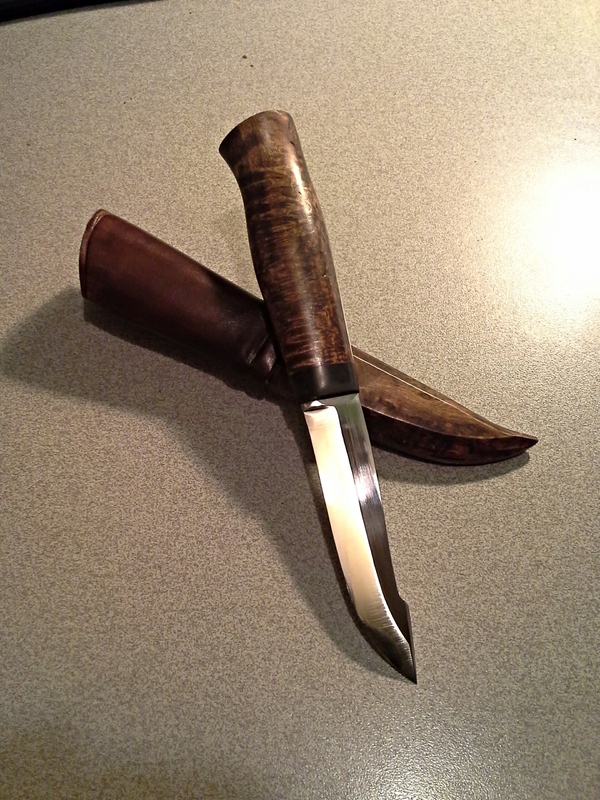 Please visit his website at http://www.nereidwobbler.com/ or look for him on Facebook.